Having trouble viewing this email? Click here to view online. Check out this month’s feature story on how pairing a structured settlement and professional administration for a Medicare Set-Aside (MSA) can provide valuable protection to an injured party. We present two case scenarios so you can see the side-by-side financial advantages versus funding an MSA with a lump sum. Professional administration also clears a path through the red-tape thicket often associated with an MSA, which would otherwise burden the injured party. As we regularly work with both the financing and technical details of an MSA, don’t hesitate to reach out for more information. The combination of a structured settlement and a Medicare Set-Aside that is managed by a professional administrator is touted as the best way to protect settlement dollars for an injured party. When hit with unexpectedly high medical costs, as the thinking goes, the pairing of these two services allows the injured party to access more coverage from Medicare and pay fewer dollars out of pocket. 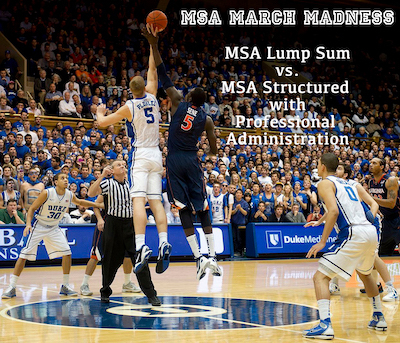 In keeping with the spirit of March Madness, we decided to put this assertion to the test for “Team Joe” and a $200,000 lump-sum settlement vs. the challenger: professional administration and structured settlements. IN YOUR INTEREST is a copyrighted publication of Voice2News, LLC. You received this newsletter because you are a valued business associate of a consultant at Ringler Associates, Inc., and have indicated your interest in receiving information via email. To unsubscribe, click here and you will be removed from our subscriber lists immediately. If you have questions, email us at InYourInterest@RinglerAssociates.com, or send your request by mail Attn: IN YOUR INTEREST care of Voice2News, 2955 Zarthan Ave. S., St. Louis Park, MN, 55416.